Fri., June 8, 2018, 8:33 p.m. It was with his voice, strong and professional, that Tom Mableson painted pictures of scenes on the ice that captivated and informed hockey followers in Spokane and small Canadian cities just North of the border from the late 1940s into the late 1980s. Born in Vancouver, British Columbia, on Dec. 4, 1922, William Thomas Mableson found his way into the Royal Canadian Navy, serving from 1943-45 in the North Atlantic Theater aboard the HMCS Runnymede escorting merchant ships. He made, he recounted, 14 trips across the Atlantic. 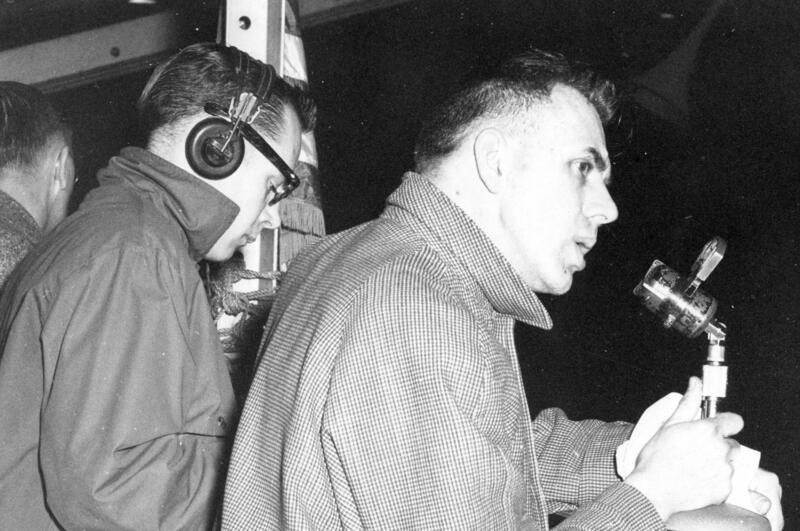 Tom started his broadcasting career in 1947 at CKLN in Nelson, B.C., as a staff and sports announcer. As chance would have it, the first hockey game he broadcast was for the hometown Nelson Maple Leafs against the Spokane Spartans in January 1948. He continued broadcasting in Nelson and Trail, B.C., until moving to Spokane in 1952 as a newlywed. Many years later, Tom recounted to daughter Kathie, that when they crossed the border, the border agent recognized his voice from the radio, and since he had told his audience he would be leaving the station and Canada, the border agent already knew why he was crossing and waved them through. Mableson became the public address announcer for the last nine Spokane Flyers’ games played in the old Elm Street Arena during the 1954-55 season before the Spokane Coliseum opened. He continued as public address announcer for Flyers’ home games and spent four years traveling with the team to do radio broadcasts of road games and playoffs. In 1957 he went to Toronto to broadcast Spokane’s trek to the Allan Cup finals at Maple Leaf Gardens where the Whitby (Ontario) Dunlops defeated the Flyers in four games. He went on to call the first two of Spokane’s four Allan Cup championship teams – the Jets of 1970 and ’72. The 1970 team was the first American team to win the Canadian senior amateur championship. He continued broadcasting into the mid-1980s – radio, television and P.A. - but there are a few more things on his resumè that should not be forgotten. He is credited with starting what became the Spokane Americans Youth Hockey Association. In the winter of 1959, he saw a youngster walking to Cannon Hill Park with a hockey stick and a pair of skates and offered him a ride. Conversation led to one thing and one thing led to another. A team and an organization were born. He became the first coach and the organization’s first president, serving for five years, and was instrumental in the formation of the Pacific Northwest Amateur Hockey Association. He also had a big impact on the sport of soccer in Spokane, playing on the recreational level and refereeing everything from youth to college, gaining the rating of State Emeritus referee. He officiated at the high school level for 21 years, working more than 100 games in 1998 at the age of 77. At 80, following his first heart attack, he was only allowed to be a soccer linesman. At 81, as a linesman at a high school game in Deer Park, he suffered a second heart attack. Good fortune, and the Lord he would later say, were on his side. Doctors and nurses were among the spectators and they jumped into action, saving his life, until EMTs arrived. All the while, he was teaching and finishing his law degree. He retired from teaching, but practiced law for 31 years, “retiring” from that just short of his 90th birthday. He was active in the Spokane Bar Association’s Volunteer Lawyer Program for 12 years and in 1995 received its Pro Bono Attorney of the Year Award. Recognizing his nearly five decades of contributions to the Spokane sports scene, Mableson was inducted into the Inland Northwest Sports Hall of Fame Scroll of Honor in 2003. He was, more than likely, a little uneasy. Mableson was preceded in death by his wife of 64 years, Muriel, who died in July 2016. Besides Schroeder, he leaves behind another daughter, Connie Mableson; son-in-law Ken Schroeder; grandsons Jonathan and Samuel; and a sister, Violet. Kathie Schroeder said a service of remembrance is being planned for sometime in late July at Manito Presbyterian Church, where Tom and Muriel were members for 51 years before moving to Stanwood in 2014 to be closer to their immediate family. Published: June 8, 2018, 8:33 p.m.